Just because Super Bowl LIII is over, it doesn’t mean NFL news shuts down. Free agency is soon approaching. In just over a month, players whose contracts have expired can officially sign with new franchises. With that said, some of the bigger-name free agents will either look for work elsewhere or re-sign with their current teams. This also marks the time of the offseason that other players destined to become free agents receive franchise tags. From a popular player who held out on his team all season and drove those who drafted him in fantasy football absolutely nuts to some stud defenders, here are 10 of the hottest free agents for 2019. In the event the Steelers do not, Bell’s phone is going to be ringing off the hook with potential suitors. Bell’s last full season saw him produce 1,946 total yards and 11 touchdowns. It will take a while for Ford to shake off his off-sides penalty call that potentially changed the outcome of the AFC Championship Game against the Patriots. But don’t let that cloud the elite stat line this Pro-Bowl pass rusher produced in 2018. Ford recorded career-highs with 13 sacks and 55 combined tackles. He was also responsible for seven forced fumbles which marked a league best. Instead of exploring free agency, this former 23rd-overall pick from 2014 wishes to stay in Kansas City — making this a storyline to keep tabs on come March. Here’s a guy that doesn’t exactly want to play for his current team in 2019. Thomas hinted last offseason about playing for other clubs and wanted a pay increase from Seattle. Though, Thomas’ year came to a halt after he suffered a season-ending leg injury in Week 4. He’ll be looking to make a healthy comeback after being drafted 14th overall by Seattle in 2010. It is worth noting that the All-Pro Safety turns 30 in May so it will be intriguing to see the type of market Thomas attracts if the Seahawks decide to move on. Lynch also fell victim to the injury bug in 2018, playing just six games under new head coach Jon Gruden. But it was enough that Gruden said he would love to see Lynch return in 2019. In those six games, Lynch averaged 4.2 yards per carry and scored three touchdowns. When healthy, Lynch has shown he can still contribute at a productive level. But it is not known at this time if Lynch wants to keep playing the game. If he does, it would be hard to imagine him playing for any other team with his home roots tied to the Oakland area. Maybe the 49ers come calling? Having posted a career-high 13 sacks, Clark is coming off of a sensational season in Seattle. He also nabbed his very first interception and recorded 41 combined tackles. Despite all this, Clark admitted he “played at “60 percent health” all of last year with elbow injuries. If so, a healthy Clark should see his stock on the rise in 2019. It would make sense for the Seahawks to keep him secured under a long-term deal as the team continues to rebuild around some of its younger players. A franchise tag is also a possibility. This year’s free agent quarterback class is not exactly as star-studded as it was when Kirk Cousins was all the buzz in 2018. But there should be a market for Bridgewater from other teams attempting to lure him away from the Saints. Currently, the Saints have a good gig going with Drew Brees followed by Taysom Hill and Bridgewater as depth options. But if the Saints decide to not re-sign Bridgewater, he will easily be scooped up by another franchise either in need of a better backup or a potential starter. This first-overall pick from the 2014 draft has been a quarterback’s nightmare over the past two seasons after dealing with injuries earlier in his career. 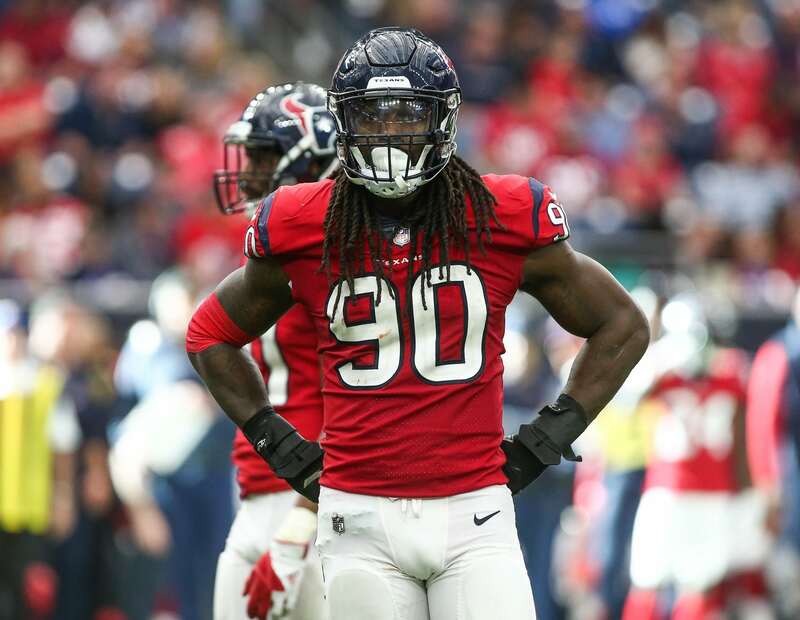 Between 2017-18, Clowney has recorded 18.5 sacks, 106 combined tackles, three forced fumbles and six fumble recoveries. All signs would point towards the Texans securing their talented pass rusher long term. If for some reason this does not happen, Clowney would be in top demand by multiple teams willing to offer him the very lucrative deal he is seeking. Ingram may be looking for work elsewhere after playing in New Orleans for eight seasons. Originally drafted 28th overall in 2011, Ingram averaged just 13.2 touches and 68 yards per game in 2018 versus the 18 touches and 96 yards averaged per contest the previous season. This drop in work significantly distanced Ingram from his younger counterpart, Alvin Kamara. After falling a hair shy of making it to Super Bowl LIII, Ingram wishes to remain with the Saints. If this is not fiscally feasible, Ingram would still garner plenty of attention in free agency after maintaining 4.5 yards per carry over his career. After two exceptional seasons since returning from a broken leg in 2016, Lawrence has proved worthy of a big bump in pay moving forward. Through 2017-18, Lawrence played in all 32 games — tallying 25 sacks, 122 combined tackles, six forced fumbles and one interception. However, with quarterback Dak Prescott and wideout Amari Cooper also in need of new contracts, the Cowboys could choose to franchise tag Lawrence again. Certainly, other teams in need of an upgrade at Lawrence’s position will be keeping an eye out. Like we covered with Bridgewater, the free agent quarterback market is not exactly sizzling with top shelf names for 2019. Though, Taylor is a viable option for any franchise that needs a more experienced backup or a guy who possesses starting capabilities. Over his 46 starts since 2015, Taylor sports a 23-21-1 record. He also has a career completion rate of 61.6 percent and is lightening in a bottle when he takes to his feet to make plays. There, he has averaged 5.6 yards per tote for a total of 1,836 rushing yards and 16 scores on the ground.